Law firms have to cover a lot of ground when it comes to attracting new clients. Having a website that doesn’t attract them means you’re trudging through the mud of the search engines. Since the legal world is one of stringent procedures and technical knowledge, doing SEO for law firms calls for specialized attention that we’ll look at here. First of all, law firms are specialized. They require the kind of website development and maintenance that medical sites do. The reason being is because of the rules and regulations of that industry. Just missing one piece of data or some unprofessional procedure could spell big trouble for all involved. Law has its own technical language and procedures. To mess up even one iota could turn into a disaster for all involved. This then makes developing and maintaining a website on the subject even more hairy. You just can’t slap up a law firm website and call it a day. No, you need to make sure the terminology is correct and that the information on the page is easily understandable by the average person and that it follows the guidelines, ethics, and standards of the legal profession. This is where the problems occur. The average SEO specialist is not a legal professional. It is akin to trying to put together and optimize a scientific site. If you don’t know all the proper terms and processes that go along with it, you’ll end up messing up and either looking foolish to the profession or getting someone in legal trouble. 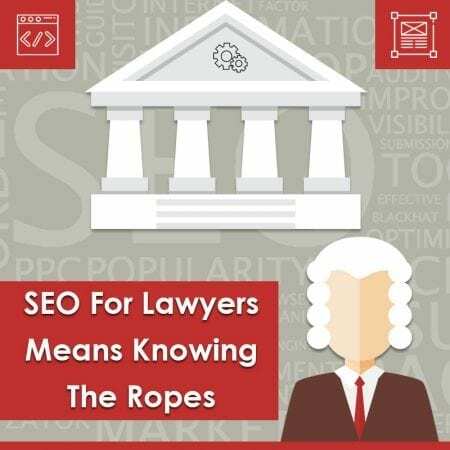 This is why if you’re a law firm and are seeking SEO help, you will need to understand that the SEO field is just as complicated with its own terminology and technical procedures. Matching the two worlds takes time and expertise that is relatively new and part of the ever changing landscape of SEO. What we may feel is the proper SEO procedure to do might conflict with legal procedures and vice versa. It’s tricky, but when you’re dealing with a professional SEO company, you can get the job done and in the future be able to adapt and change for better results. Being that both fields are highly specialized there might be a tendency to engage in pecking order procedures. As a lawyer your concern will be that the information on your website follows the procedures and lawful ways to present your services. As an SEO specialist your concern will be that the technical data of the legal industry can be applied to the standards and technical specifics of SEO. This is where the conflicts may occur and that is why a good deal of dialogue is required. You can’t be hard headed and demand things be one by the other. You must take time to explain why certain things need be done in a specific way. Legal firms cannot post information or data that is illegal to do as they are required by law to present certain information in a specific way. For example they cannot make claims that they cannot prove or go in conflict with the regulations. An SEO pro might say to the legal firm that they should do this hype thing or another but not realize it’s against the law to do so. On the other hand, a law firm might request things that go in conflict with standard SEO procedure that will harm their chances of getting their webpages indexed properly. When it comes to handling highly technical web data such as the law, I SEO U is the company to go with. They’re familiar with the fact that law firms have to state specific things and that that data is important to the indexing of webpages properly in the search engines. You will get their professional customer services at an affordable price and they will continue with you through the duration of your SEO campaign. The simple decision is go with I SEO U and feel relaxed that your investment and effort will be well applied.